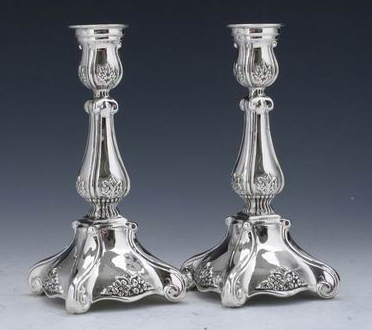 This pair of high-worked medium-height candlesticks in 925 sterling silver from Hadad Silversmiths brings a touch of old-world style to your collection of silver Judaica. The square base of each candlestick is embellished with finely-carved scrolls at each corner, raising the sides of the base slightly. The raised sides feature a convex curve stretching from corner to corner. A cluster of raised flowers is carved on top of the curve. The base of polished silver curves inward as it tapers, meeting a small hourglass-shaped section carved in vertical lines, similar to the embellishment decoration on a Grecian urn. This is topped by an elongated pear shaped with delicate carving at its base and top. Shabbat candles sit in the candle holder (an inverted bell), below which the candlestick narrows again and is carved with vertical lines. The combination of stark vertical lines and a flowing overall shape recreates the motifs used in silver tableware for generations. The set of Shabbat candlesticks measures 5.9 inch (15 cm) and weighs .35 pounds(160 grams). Set out these candlesticks on your own Kabbalat Shabbat or holiday table, or give them as a gift. The classic styling and fine workmanship in these sterling silver pieces ensure that they will become treasured heirlooms to be enjoyed for generations.